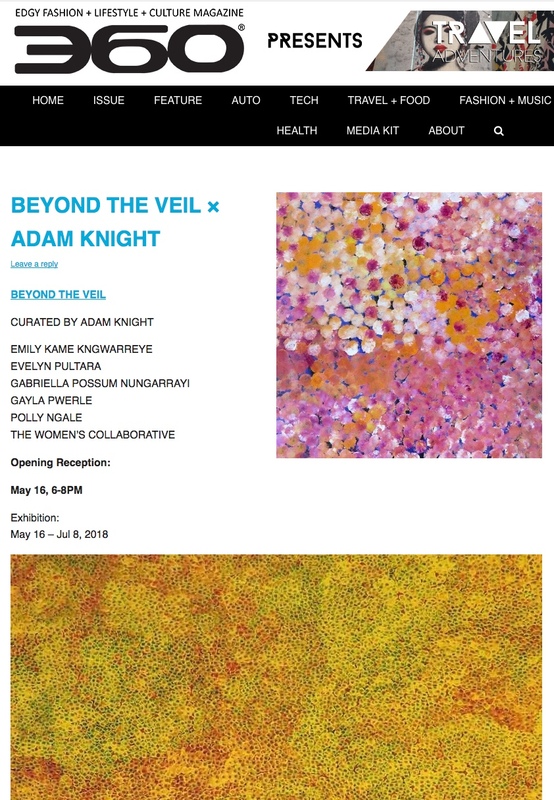 _view full article online Olsen Gruin is pleased to present Beyond the Veil, a group exhibition of Western Desert Paintings curated by the President of the Aboriginal Art Association of Australia, Adam Knight. The anticipated show features select works by Emily Kame Kngwarreye, Evelyn Pultara, Gabriella Possum Nungurrayi, Gayla Pwerle, Polly Ngale, and the Women's Collaborative comprising Beverly Cameron; Kathy Marinkga, Imitjala Curley, and Tjangili George, and will be on view from May 16 - July 8, 2018. It is widely accepted that Australian Aboriginals have the oldest continuous culture on the planet. The rise of contemporary Australian Aboriginal art was described by art critic and writer Robert Hughes, as "the last great art movement of the twentieth century." Whilst the works are considered contemporary, they are derived from a cultural awareness and sacred knowledge that remains preserved by artists such as those exhibited here. Beyond the Veil aims to remind viewers of the cultural narrative that celebrates the presence of the dot and acknowledges the genius of its use by its originators: the artists from Australia's first people.